Today instead of skiing I went swimming at the BV Nordic Center. We (H and I) had a blast in the pool and most importantly it wasn’t too crowded. The pool was in perfect condition and H spent the day doing somersaults in the water. The water was warm and the windows gave you a nice view of the great outdoors. There was a lot more to do than just swimming– you could play pool, arcade games, ping pong, etc! They even had a local snack bar for when we got hungry and thirsty. Next time I’ll bring my camera so you can see what its like. 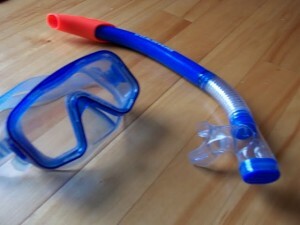 For now, here’s a pic of my favorite snorkel & mask. We (my whole family) are in the beginning stages of a yucky cold… and due to the extreme cold weather I’m probably not going to go skiing this weekend. If YOU brave the cold and hit the slopes (anywhere in Vermont), comment below and let me know how it was. And if you want to give me a full report, I’ll feature you as a guest blogger.